Stitch Size: 46 by 46. Model stitched on 10 count Light Blue Aida. Finished size is 4 1/2 inches by 4 1/2 inches. 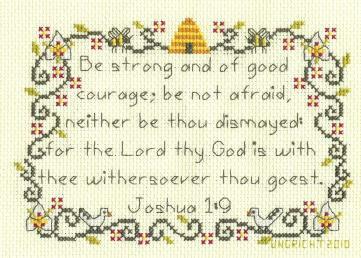 Also may be stitched on 14 count Aida, finished size 3 1/2 inches by 3 1/2 inches. Welcome to Yvette Ungricht Cross Stitch! 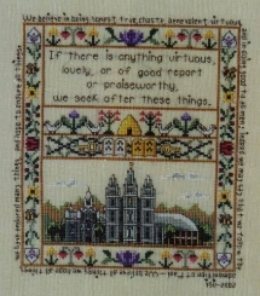 Looking for a cross stitch project that is original and reinforces your LDS (Mormon) faith and values? I've got it here for you. There are patterns for the beginner as well as the most advanced stitcher. Contact me at (801) 278-9316, or at yvette@yvetteungrichtcrosssitch.com. I ship world wide. Payment may be made through checks or PayPal. 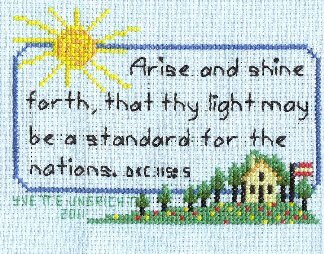 Large counted cross stitch of the favorite Primary song "My Heav'nly Father Loves Me," (Whenever I hear the song of a bird....) Finished size is 14 inches by 36 inches on 28 count even weave cotton. Sewn with DMC flosses and Simply Shaker Threads, glass seed beeds and optional Fimo clay buttons. 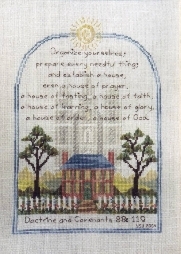 This Counted Cross Stitch Sampler was stitched on 32 count white cotton even weave over two threads with DMC floss and glass Mill Hill beads. The stitch size is 182 wide by 476 high. The finished sized is approximately 11 1/2 " by 30 ". The sampler can also be stitched on 28 count evenweave or linen. In that case the finished size will be approximately 13" x 34". Since some of the specialty stitches in this sampler are over one thread, aida cloth is not recommended. The small Hardanger border near the bottom of the sampler does not involve any thread removal. Instructions for all specialty stitches are included in the pattern. 1st Prize winner, professional division 2014 Utah State Fair. Selected for exhibition, 10th International Art Competition: Tell Me the Stories of Jesus, LDS Church Museum, October 2015 to August 2016. This counted crossstitch patterns was stitched on 32 count white cotton even weave stitched over two threads. The stitch size is 103 wide by 326 long. 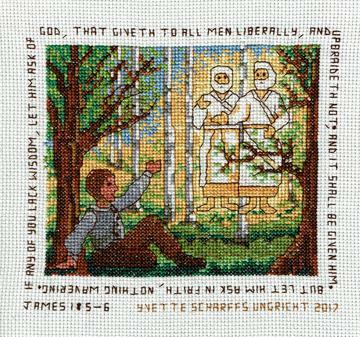 The finished size is approximately 6 1/2" by 20 1/2". Framed size is 10" by 25". The lower border has some hardanger, but a substitute method for finished is provided for those uncomfortable with this technique. The pattern is stitched with DMC embroidery flosses. The bottom border needs a size 12 DMC Perle cotton if the Hardanger is stitched as in the sample. 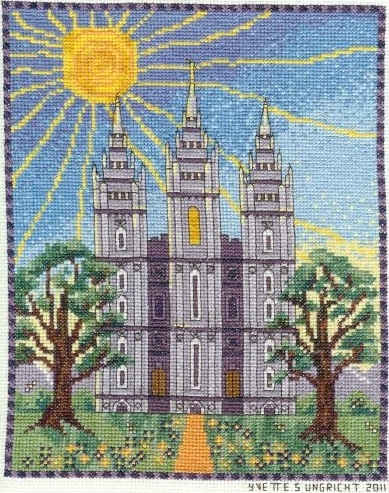 This pattern won 2nd place at the 2012 Utah State Fair. 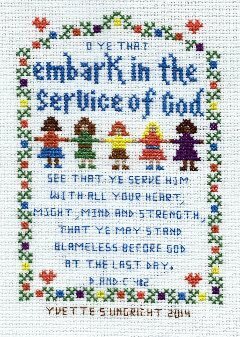 The Young Women's Theme is a counted cross stitch chart that uses back stitch and French knots for the lettering and cross stitches for the rest of the project. No advanced stitches are used in the project. It was stitched on 14 count white Aida cloth using two plies of DMC floss. Stitch size is 113 wide by 244 long which works out to be 8 inches by 17 3/8 inches. It fits perfectly into a pre-made 10 inch by 20 inch frame; there is no need to have a custom frame made for this project. It was designed to be easy to stitch. The Young Women's Theme is not short, so this project is not small. A stitcher with a little experience following a chart and a fair dose of patience should be able to stitch this pattern. The temple scene at the bottom is easy to stitch if you start with the temple, sun, trees, hills, moon and finish with the stars and sky. Absolute accuracy is not needed for the sky and stars. Just enjoy the process and relax and it will turn out all right. Retail Price: $12.50. I saw this stitched up in a petite pointe shop in Vienna, Austria, but could not afford the price of the finished project, so I made up my own, fixing some of the original water color painting's details to satisfy the musicologist in me. In the original, Leopold Mozart was holding his bow and violin wrong, was crossing his legs (something the greatest violin teacher of all time would have never done), and the harpsichord was mysteriously missing some legs. I think Leopold, Nannerl and Wolfgang would approve. 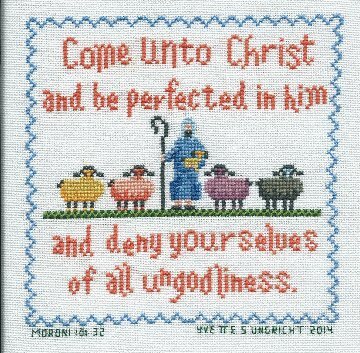 This sampler was stitched on 32 count white evenweave cross stitch fabric with DMC floss over ONE thread. I could not obtain locally the petite pointe screen used by the Europeans without buying and shipping 10 meters of the stuff, so I improvised with what I had on hand. It worked out just fine. The finished size is 6" x 6". I used a magnifying glass and a lot of patience. The pattern could also be stitched on any count of Aida, Linen or evenweave you desire. Your finished project will just turn out twice as big and you will be half as stressed. 1st Place, Professional Division, 2014 Utah State Fair. 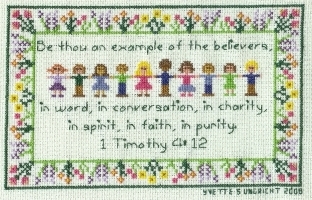 This counted cross stitch is on 28 count Khaki cotton even weave stitched over two threads. The stitch size is 252 wide by 308 high. The finished size is approximately 18 inches wide by 22 inches wide. This sampler can fit perfectly in a pre-made 20" by 24" frame. The model has been custom framed. The original contains many specialty stitches on the side borders and the lower border contains Hardanger cutwork. If these advanced techniques do not appeal to you, the pattern contains alternate suggestions for the sections that have specialty stitches such as the side borders and lower border. The entire sampler can be stitched on 14 count Aida cloth if you wish to do an easier project than the original. There is a cross stitch alternative to the lower Hardanger border. If you are into tricky stitching, the Hardanger border and specialty stitches are all described in detail in the pattern booklet. The pattern is stitched with DMC embroidery flosses, Weeks Dye Works Embroidery flosses and Mill Hill Petite Glass Seed Beads. If you choose to stitch the original lower Hardanger border, you will also need some DMC Perle cottons in size 8 and 12. First place winner in the 2011 Utah State Fair. Retail Price: $35.00 plus shipping.